Autoren und Autorinnen sind aufgerufen, ihre Beiträge dazu einzureichen. The second edition of Contemporary Media Ethics will include new cases — most, if not all — in various areas of mass communications: (1) print and broadcast news media, (2) the Internet and social media, (3) advertising and public relations, (4) entertainment media, and (5) global media and international communication. This is a major revision. Living in the globalized world where different cultures and values constantly clash, we must carefully reflect on our ethnocentric ways of resolving an ethical conflict, become aware of various non-utilitarian approaches to decision making, and hone our skills in moral imagination. 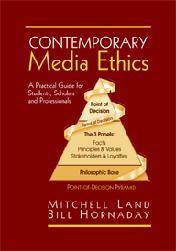 Appropriate for both undergraduate and graduate courses in media ethics, the second edition tries to expose its readers to non-Western and non-dominant Western philosophies in comparison with utilitarianism—the dominant philosophical framework of U.S. or Western mass communications practices—in order to make them realize how useful the non-utilitarian approaches, whether non-Western or Western, are to break an impasse in our moral reasoning. Das Buch wird von Marquette Books LLC verlegt. Einreichungsfrist ist der 01.Dezember 2010.